We’ve written about them before. And we will continue writing about them. They aren’t new, but they’re versatile. We’ve discussed multiple topics about Bluetooth. 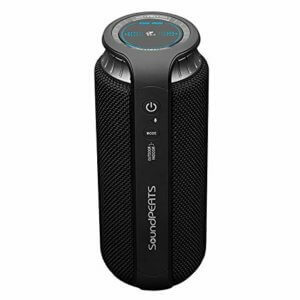 From understanding Bluetooth, to “the best portable Bluetooth speakers”. But we’ve never talked about their affordability. 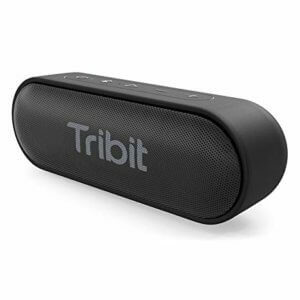 We have to tap into the “Bluetooth speakers under $50” club because it’s a legitimate market. There’s a reason a lot of the “best speaker under x” posts have risen lately. Manufacturers and affiliates see dollar signs, and they’re everywhere. Not only are they cheap, but companies give them different features to make them stand out from the others. With any market that makes money, there will always be competitors. And when there are competitors, there will always be an influx of products. 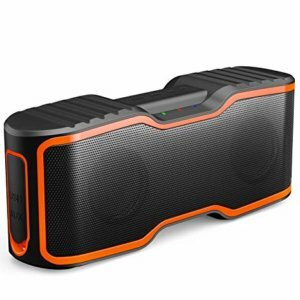 If you’re looking for serious bass on your outdoor Bluetooth speaker…. congratulations, this isn’t it. What it does have is crisp, audible sound quality. It’s so sharp it feels like you dived into a pool of freezing water. You know what else lasts for 8 hours? That’s a long time considering it’s your whole day. As for its physical features – you get a clipper so you can attach it to your handbag, or backpack. Coming in with a lightweight feature, it makes it easy to carry around. If you’re by the pool and you have no loudspeakers, consider this an alternative. What makes it perfect for the pool is it’s waterproof. So if you’re getting rowdy at your pool party, don’t worry about accidentally throwing it in the pool. In addition, the Bluetooth speaker also comes with an audio cable so you can connect your phone whenever it’s not in Bluetooth mode. 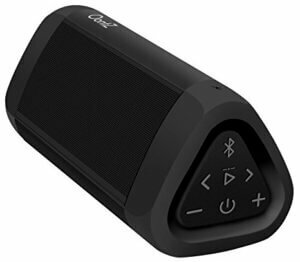 Overall, it’s a convenient Bluetooth speaker which provides tough durability with its compact size. This makes it the perfect on-the-go Bluetooth speaker under $50 on the market. 40-watts of boom blastin’, party-dancin’, double glancin’, son of a gun. Thanks to Ric Flair, that sentence above is all you need to know about what this bad boy can do for your house. With a dual 3-inch LED, you get a speaker which will stand out from the rest. An illuminating light comes with the speaker. And you get you the ability to change that color and bounce with the beat. This is similar to outdoor party speakers with lights. Another impressive fact is the speed of connectivity. In 5 seconds, your phone will connect to the speakers. This leaves you without the hassle of trying to find the connection. Once you find it, BADA BING BADA BOOM. One downside to a speaker like this is the charge time of 2.5 hours. An iPhone can charge to full capacity in 1-1.5 hours…why does it take 2.5 hours for a Bluetooth speaker? A redeeming quality is the top sound quality. 2 channel stereo will deliver that top sound quality you’re craving. And unlike the first product, this speaker plays like a loudspeaker with booming bass. What makes this Bluetooth speaker even more appealing is it prevents disruption with a built-in limiting circuit. A built-in limiting circuit reduces the current in a circuit. We went over Ohm’s law multiple times in different articles so we won’t display it here. But if you don’t know, more current means more voltage or less resistance. We don’t want too much resistance or else distortion comes into play. And distortion equals bad in terms of sound quality. This next speaker looks like a placeholder for plants, but it gets the job done. One thing we can say for sure is you’re not going to be blown away by the technology which comes with the speaker. But a Bluetooth speaker under $50 won’t always get the best features, it’s just a fact of life. What it does provide is a battery duration of 12 hours if you play the volume up to 70% power. Remember when we mentioned the speaker could be a placeholder, well, it can hold plants, but it can also hold smaller items like pencils or rubber bands. In addition, now that you know it can hold plants, you can also place it outside in your backyard if you don’t have outdoor speakers. If you’re worried about Bluetooth connection when you place it outside, don’t worry, it goes as far away as 33 feet. Another feature which makes it compatible with the outdoors is it’s “waterproof”. We say that in quotations because you can’t totally submerge it in water, but if you splashed it with water, nothing would happen. For any decor-conscious homeowner out there, this product goes well with any house setup you have. The warm lighting it emanates makes it easy to place right next to your bed. It can act as a nightlight whenever you’re sleeping. Its modern, sleek design goes well with its color scheme. Combine this with warm lighting and the speaker can be placed anywhere. With its compact size and friendly features, it’s a cute addition. A great purchase for anyone who doesn’t want their sound quality to be over the top. 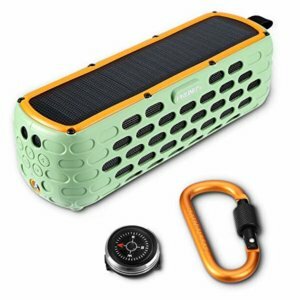 Portable Bluetooth speakers that are solar powered are different. But just because it can be charged by the sun doesn’t mean it can’t be charged with a battery. If you spent 10 minutes charging its solar panels, you’ll get 33 minutes of use. But if you went with the lithium batteries, you’ll get 30 hours with maximum volume. The last sentence isn’t a typo. If you were to go old-school with your charging, you can use a USB and charge it for 2.5 hours. They’re multiple ways in which you can power this speaker. This is an attractive feature especially if you’re traveling. In addition to its travel features comes its silicone wrapped coating. This is great if you were to drop it. The only caveat is it only guarantees no damage if it’s dropped 6.5 feet and below. Similar to the speaker above, you can splash water on it without damaging it. The specifications even state you can wash it with water. From our perspective, this speaker looks and feels like a tank. Its colors even make it look like one. This is why we believe if you’re going to purchase it, use it more for the great outdoors. The long-life battery plus the way it charges makes it super reliable to last. If you don’t know Drake, you are living under a rock. This is the only way we can explain it. In the social media age we live in now, his influence is everywhere. It’s safe to say he’s a cultural icon. From memes to captions, his highly publicized life has taken him to pop star status. It’s no wonder he has a billion streams on his new album “Scorpion”. This next speaker is close in terms of popularity. It will be everywhere in 3-5 years if it hasn’t already. The Amazon “Echo Dot Smart” speaker is special because of its versatility. Imagine sitting in your living room relaxing with your family. You’re watching a thrilling movie, but notice your stomach gurgling. You don’t want to get out of your seat and get your phone because you’re enjoying the movie. What you decide to do next is what everybody will be doing in the future which is using their voice to make a command. It goes like “Alexa, call Pizza Hut!”, after 5-8 seconds you’re on the phone with customer service and asking everybody what they want to eat. This is the convenience Echo Dot will provide. Using your voice is plain faster than typing. The voice command is so strong that it’ll identify your voice even when music is blaring out of it. We can’t even get our mothers to hear us when they start talking. It can also connect with other speakers you have in the household. So if you have a home theatre setup, you can command Alexa to play a music video and your music videos will play simultaneously. One major downside to this is its outdoor capabilities. Unlike other portable Bluetooth speakers under $50, Alexa doesn’t stand a chance in a tough environment. If you’re looking for something innovative and helpful around the household though, this will do. It’s like a command center for your house. Other speakers we’ve talked about in this post are durable. But this speaker is the definition of durable. When you think of “waterproof”, you think of items you can bring into the swimming pool correct? Well, other speakers we’ve mentioned can’t even be submerged. This speaker is different because it can be submerged in water up to 1 meter for 30 minutes. If you don’t think that’s durable, just know they advertise this speaker as “run over” proof. When we say it can be run over by a car and still function, this is what we mean by “run over” proof. Other durable features consist of being dust-proof and mud-proof. Small particles of dirt on the Bluetooth speaker won’t affect its function. If you managed to surround this speaker around outlets, it can withstand any electricity because it’s shock-proof. If you plan on going a snowboarding/skiing trip consider bringing this with you because it’s also snow-proof. For someone that also wants sound quality, this brings 40-watts to the table. 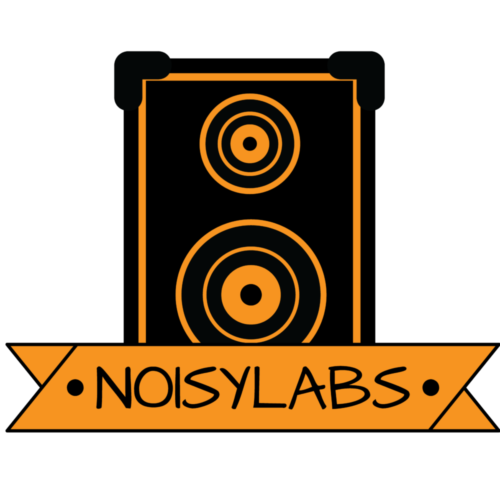 We can attest to the sound quality because of the brand. Most of the reviews this specific brand provides are of high quality. And if that doesn’t satisfy you, it also comes with a 12-month warranty with excellent customer service. so any qualms you have with your precious time and money is risk-free. As for negative aspects, we can’t think of anything that’ll deter you from purchasing. This is perfect for someone who considers themselves as the adventurous type. It fits all terrains and is easy to carry. This speaker is built like a 3-dimensional triangle. One noteworthy fact about this product is the distance. You can be a 100 feet away from this speaker and it’ll still work fine. Considering most of the speakers here average around 30-50 feet, that’s almost double or triple the amount. Also, this product has 3 speakers thanks to the design. Most of the speakers here have 2 because of their shape. In addition to its speakers is its sound quality. The first bullet point you see on Amazon mentions its superior sound quality along with its super bass. When we imagine 3 speakers plus booming bass, we picture a portable boom box. Problem with this speaker is it only has 14 watts of power. It’s definitely not the strongest of the group. Another downside is it’s not fully waterproof. Just like most of the others, it can’t submerge completely into the water. The most it can handle is spray and splash. Consider this product above average because it has all the qualities you want in a speaker, plus more. It isn’t as versatile as the Echo Dot, but it can hold its own against the majority of Bluetooth speakers under $50. “The big fundamental” is a nickname for the great Tim Duncan. He was a big man who had all the basics of basketball down to a tee (hence the name “big fundamental”). We call this speaker the “big fundamental” because it’s a regular speaker which nails everything a normal speaker should. It has a 24-hour battery life which is above average compared to the rest of these speakers. The design is clear to see because all of it is located in one place. Seamless control and a drop-proof build make this speaker reliable. There is no way you should be confused using this speaker. Its all black design can help it fit anywhere. Its regular shape also helps it fit anywhere in the house. Along with these features is its fast Bluetooth connectivity. This strong connection lasts up to 66 feet and connects in a matter of seconds. For us, we don’t see anything wrong with this speaker. It covers everything you would want in a portable Bluetooth speaker under $50. We’ve written on touch speakers before. 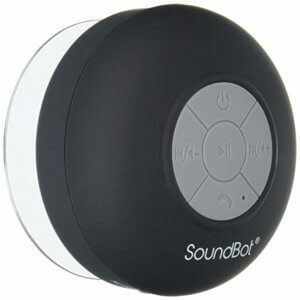 This touch speaker is made easy for any owner to navigate. Even if you’re not the actual owner of this touch speaker, you’ll have no problem figuring it out. Similar to all Bluetooth technology, this speaker re-connects to all devices it was connected to before once it’s turned on. Another similarity it has with other speakers is a long battery life. 12 hours is the average lifespan for this product if you keep it at 75% volume. The downside to this Bluetooth speaker is there is nothing unique about it. The 12-watt power is nothing impressive and the re-charge takes 3-4 hours with a USB cable. There is no mention of lithium batteries or any other type of battery for that matter. It’s solely dependent on a USB cable to charge. 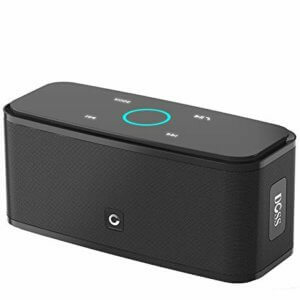 When we say surround sound, we mean it with this portable Bluetooth speaker. Its design resembles a cylinder and that allows it to have that surround sound effect. To make it sound like a live performance, the speaker has a passive radiator. This is one feature which distinguishes it from the others. power bank or USB port. Its versatility also adds to its value. A part of its versatility is the different modes you can use it for. This speaker switches between indoor and outdoor modes making it the embodiment of versatility. 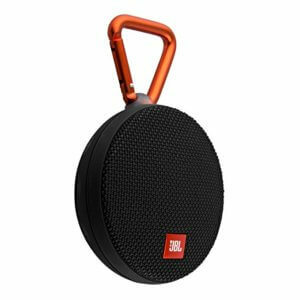 While some portable Bluetooth speakers under $50 are either meant for outdoors or indoors, this Bluetooth speaker should be taken on hiking trails and households. What makes it easy to travel with is its weight of 19.7 ounces. 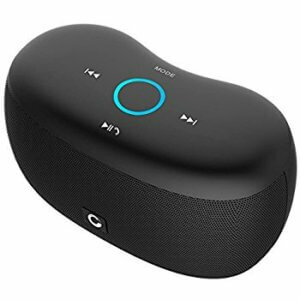 We consider this Bluetooth speaker worthy of its price because of the value it brings. Plus, it looks like another water bottle that can fit in with your luggage. Another touch speaker, but the difference is this one is blue. A unique feature of this speaker is how tiny it is. 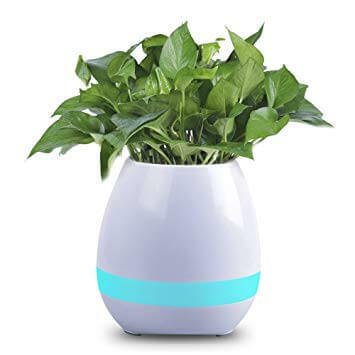 It can literally fit on your palm which makes it suitable for small areas in your house. Although it can go outdoors, its design doesn’t make it advisable because there is no mention of durability anywhere. You can tell by looking at the picture it’s not as durable as other speakers mentioned here. One cool feature is the volume control. With the tip of your finger, you can either decrease or increase the volume depending if you go clockwise, or counter-clockwise. Aside from the volume feature and its color, this is a speaker we wouldn’t recommend as much as the others. There isn’t too much to distinguish it from the others, but that’s only relatively speaking. For someone who is looking for their first speaker, then this choice is solid. This is another example of a speaker which is labeled “waterproof”, but can’t be submerged in water. What it can do is take a direct spray from a showerhead. Its rating of IPX4 means it can be used for showers or outdoors. 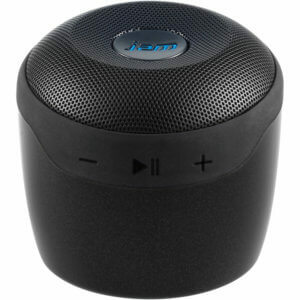 Other protective features of this mini speaker are dust-proof and shock-proof. With an alloy metal hook and detachable suction, this makes it suitable for your backpack and shower. You can also place it on your fridge if you’re lacking for sound in your kitchen. As for sound quality, it packs a small punch (5 watts). Either way, you don’t need too much power because the shower provides great acoustics for our singing. Who needs the extra 30-40 watts? Weighing in at 1.6 ounces, this speaker is delicate, but it holds its own. Its design is simple and easy to use. All the buttons are centered in one section where the user can see. For homeowners into aesthetics, this speaker also comes in a variety of colors to match your decor. It’s perfect for small tables and showers (splash-proof) because it has a suction cup to stick anywhere. For someone who’s more interested in sound quality, this speaker covers the whole range of the sound spectrum. From bass to treble, a small speaker usually doesn’t deliver, but this one makes it easy to dance to. The whole design of the speaker makes it convenient for owners to bring it anywhere. 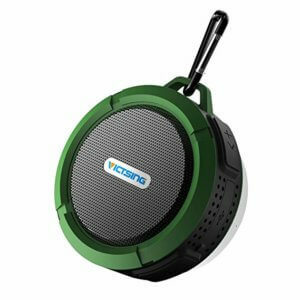 From indoor to outdoor, this speaker makes it easy to always have a Bluetooth speaker. If you’re not fully convinced into getting an Echo Dot, consider this alternative. Although bigger, it provides the same features except it doesn’t look the same as the Echo Dot. In fact, this one looks like an actual speaker. 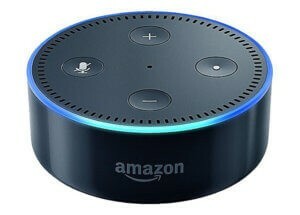 Speaking from experience, the Echo Dot looks made to specifically spy on you and record whatever you say. Most of the people we dealt with say this speaker envokes a paranoid feeling while they’re alone with the Echo Dot. Sometimes it evens starts playing music, or talking when nobody has said anything. Unlike the Echo Dot, this speaker fits right in with a home theatre. It’s a quick and easy set up excluding complex wires and installation. It’s perfect for mid-sized rooms and is adequate for any living room.